Presence of bicolor, tricolor and sable colors. 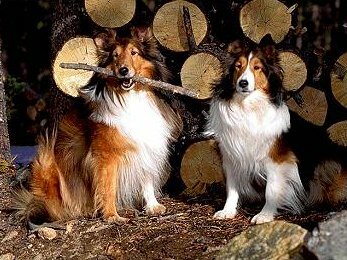 There are three "a" alleles at the agouti locus in Shelties that cause the three main coat colors. Each of these may occur with or without Merle. At the present time there is no DNA test for Merle, but since the merle pattern is exhibited by the Mm heterozygotes, the phenotype is predictive of the genotype. Note that "MM" dogs are primarily white, and conscientious breeders avoid producing such dogs since deafness and eye defects are common. DNA testing for the "a" alleles in Shetland Sheepdogs that are sable or tricolor allows breeders to better predict the colors of pups from particular matings. Although some breeders believe they can "see" the difference between a homozygous and heterozygous sable, this has not been reliable. Some breeders refer to dogs that are homozygous sable as "pure for sable". Shetland Sheepdogs should have all EE and BB alleles; though there is some rather weak indication that "ee" has occurred in the past, probably from spaniel ancestry. Brown (b) allele do occur in Shelties, usually as surprises since neither is an acceptable color. Testing relatives of these "miscolored" dogs would be of interest to breeders. DNA tests for both "e" and "b" alleles are also available in our laboratory on request. Test results are usually available in 10 from the moment the samples arrive at the laboratory. Test results can be reported by e-mail, fax, or by phone.